We grow on 1 acre of intensively cultivated garden space. 'Intensive' in this case means we use tight spacing between our plants and between our plantings: when a bed is done producing one crop, we quickly seed or transplant the next thing we would like to grow there. The principle here is that something will be growing on that garden space, so it might as well be a useful vegetable or cover crop. 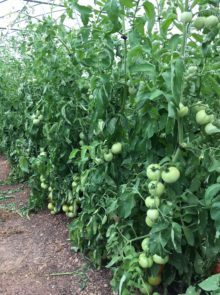 On top of making business sense for a small-acreage farm, quick turn-over of thickly planted crops is actually good soil stewardship as long as gentle cultivation methods are used and a sound crop rotation is followed. We do not use any pesticides, herbicides, or synthetic fertilizers in our production. Some of these substances may be useful if used responsibly, but we consider them unnecessary for our farm. For pest control, we rely heavily on physical barriers - floating row covers and anti-insect netting. 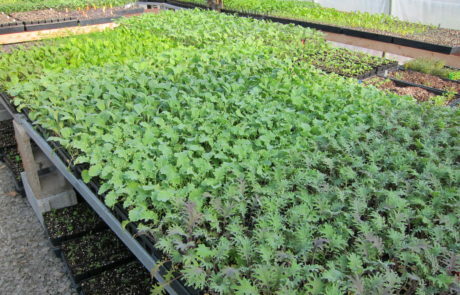 Row-covers are used in the spring and double as frost protection for seedlings. Anti-insect netting is used in the summer when the thermal effect of row-cover is not needed. 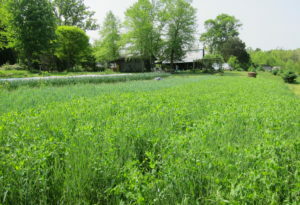 We employ a crop rotation to disrupt the life cycles of crop-specific pests, and try to maintain a healthy farm ecosystem to create a habitat for beneficial insects in and around our gardens. Landscape fabric is our method of choice for suppressing weeds. 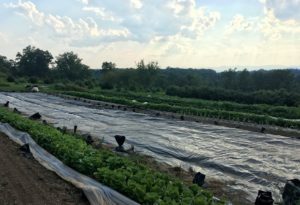 In addition to working as a weed barrier, these coverings help our beds retain moisture at the shallow root level of many market vegetables. 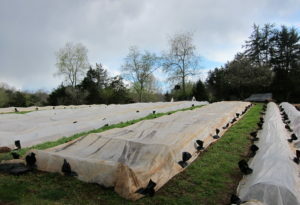 When beds are between plantings, we either sow a cover crop or cover them with tarps to prevent weeds from growing. When weeds inevitably do pop up, we remove them in the earliest stages with stirrup and collinear hoes, a flame-weeder, and the ultimate in precision garden tools: our hands! The permanent raised beds in our gardens help maintain soil structure by minimizing compaction. 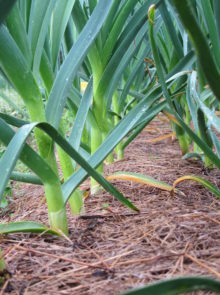 After a bed is made, it is never deeply tilled again, allowing soil biology to thrive. These beds also promote better drainage, reduce the amount of garden space that needs fertilization and provide better sun angles (and ergonomics!) by slightly elevating plants. We use a two-wheel tractor with several implements for mowing, re-building raised beds, and preparing soil for planting. We rarely do deep tilling and instead rely on a broadfork to loosen and aerate the soil before planting. A power harrow is used to create a smooth seedbed without inverting the soil layers. 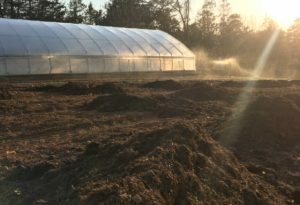 We think there is a place for modern equipment on small farms as long as it is used to guide and massage farm ecology instead of to churn and dominate it. Our 200+ laying hens roam free on 10 acres of fenced pasture from dawn to dusk every day of the year. 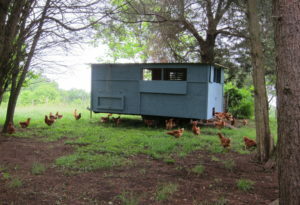 Their coops are moved to fresh grass each week, allowing the pasture to recover behind them. They are expert foragers and enjoy eating insects, grass, kitchen scraps and our non-GMO feed. 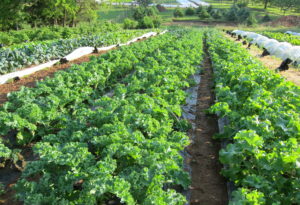 Our vegetables, mushrooms and seedlings are certified organic.